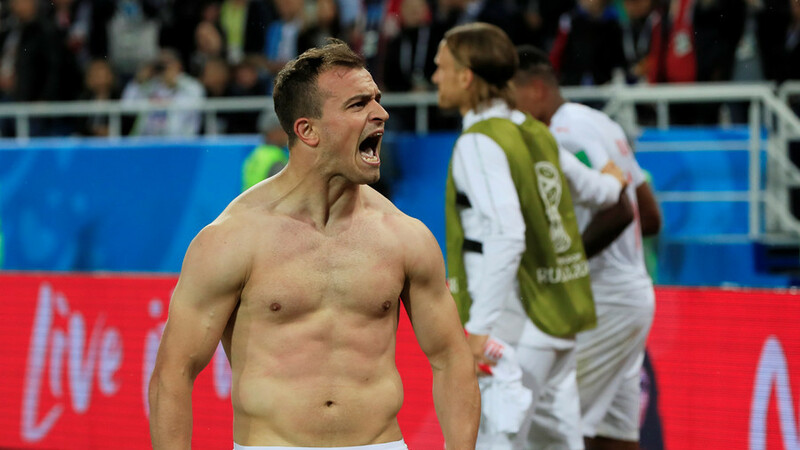 Shaqiri broke free from the half-way line in the 90th minute to shoot past Serbian keeper Vladimir Stojkovic, sealing a comeback which began when Granit Xhaka leveled after Aleksandar Mitrovic had given Serbia an early lead. The Serbs went into the clash on the Baltic coast on the back of a 1-0 opening game win against Costa Rica, while the Swiss had earned a comeback draw against Brazil in Rostov. In a frantic opening in the Russian city on the Baltic coast, Mitrovic gave Serbia the perfect start when he headed in from a Dusan Tadic cross on five minutes. The highly-charged start continued as the teams registered eight shots in the opening 15 minutes alone, as Serbia surged forward and the Swiss struggled to contain the threat posed by Mitrovic and Tadic in particular. Swiss forays forward were rare in the opening stages but they did threaten twice through Blerim Dzemaili, who shanked wide when well-placed and also missed a guilt-edged chance on the half-hour mark when found space behind the Serbia defence, but made weak contact and allowed Stojkovic to save in the Swiss goal. Serbia continued to press as the pace rarely let up, and Nemanja Matic could have doubled their lead but he failed to make contact when unmarked at the back post from a corner just before half-time. Switzerland – who went into Russia 2018 as the sixth-ranked team in the world – emerged from the second half looking more potent, and found the equalizer through a thunderous strike from midfielder Granit Xhaka when the ball span loose to him on edge of the box on 52 minutes. 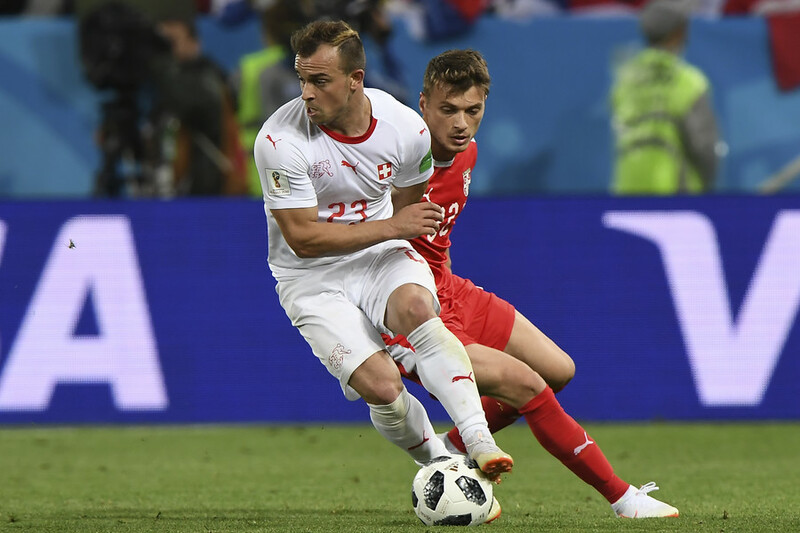 The Swiss almost sneaked ahead when Shaqiri hit the junction of the post and crossbar when he cut inside and fired a rasping drive from the left as Switzerland started to press. That sparked a spell of Serbian pressure just as they looked to be tiring, with Aleksandar Kolarov sending a tantalizing ball across the box that was just out of reach of his teammates lurking in the box. Serbia felt they had a penalty claim on 66 minutes when Mitrovic was hauled down, but German referee Felix Brych adjudged that the Serbian forward had been the culprit in a decision that bizarrely was not referred to the video assistant referee. The game see-sawed once again as Switzerland took the ascendency in the closing, with pocket-rocket Shaqiri threatening on several occasions as the Swiss pushed for the equalizer. The breakthrough came when Shaqiri raced through on 90 minutes, outpacing Dusko Tosic before firing past the Serbian 'keeper. The earlier result in Group E had seen Brazil strike a late double to sink Costa Rican hopes and move the Samba Boys onto four points. The Swiss win puts them level with Brazil in a tightly contested group, with Serbia on three and Costa Rica down and out with no wins from their two games. The group finale next week sees Switzerland take on Costa Rica in Nizhny Novgorod, while Brazil take on Serbia in a crunch game at Spartak Stadium in Moscow.